People listen in the crowd as U. More broadly, more than 80 percent of principals said some of their students had disparaged other ethnic groups. The UCLA study is called "School and Society in the Age of Trump," but its author said the Republican president is not solely responsible for tensions at secondary schools. "The report is a story of this particular time, not narrowly a story of the actions of this one president, although this president's actions contribute to it," John Rogers, a professor of education at UCLA, said by phone. A White House representative declined to comment. The UCLA report described a charged environment at high schools, with most principals having to deal with students who make hateful or hostile remarks about other people's ethnic background or political beliefs. Groups of white students at some schools have chanted "Build the wall!" to demean students of color, according to accounts from several principals to researchers. Those and other instances of racial hostility at high schools bear a resemblance to Trump's rhetoric on immigration, the study said. To bolster their contention that some hostility at schools is due to Trump's positions, the study points to a 17 percent rise in hate crimes across American society in 2017, the first year of Trump's presidency. Some conservative students have also encountered venom from classmates. Nearly half of principals told their students to respect students with unpopular political views, and one third emphasized the importance of tolerating the views of conservatives. 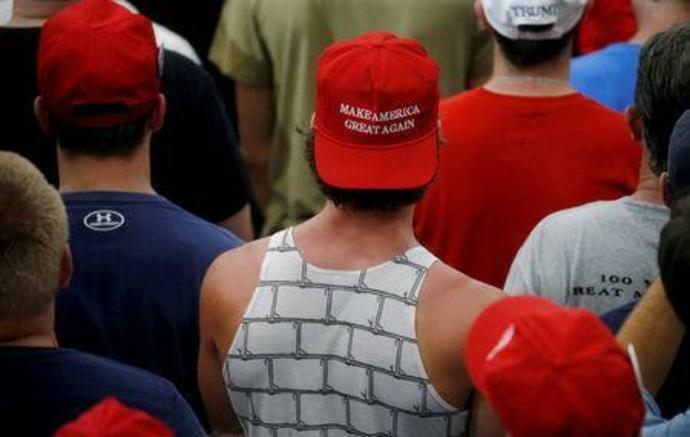 In Wisconsin, one principal reported a small group of his students arrived at school one day wearing Trump's signature "Make America Great Again" hats, which offended some liberal teenagers and led to a fistfight. In another episode, some students in Connecticut made demeaning comments to a white student after she showed support for Trump, a principal told researchers, and the pupil felt her teacher did not defend her right to express herself. The report also found high schools are affected by other social problems, such as opioid addiction and firearms violence. Pac-12 Networks' Amanda Borden interviews Kyla Ross following UCLA's third-place finish at the NCAA Championships in Fort Worth, Texas. Ross scored a 9.95 on balance beam, vault and uneven bars. Pac-12 Networks' Amanda Borden speaks with Valorie Kondos Field after her final meet, the NCAA Championships on Saturday, as UCLA head coach. Kondos Field, who led the Bruins to the 2019 Pac-12 Championship title, is retiring after 29 years at the helm of the storied UCLA program. Pac-12 Networks' JB Long and Evan Moore break down UCLA's strong defensive showing, Dorian Thompson-Robinson's efficient and confident presence in the pocket during the Bruins' spring game on Saturday at Drake Stadium.